Some of the more than 80 alumni, family members, students, and faculty of WSU’s Cooperative University Dairy Students, or CUDS, reunite Saturday, Jan. 26, 2019, at Ensminger Pavilion (Seth Truscott-WSU Photo). 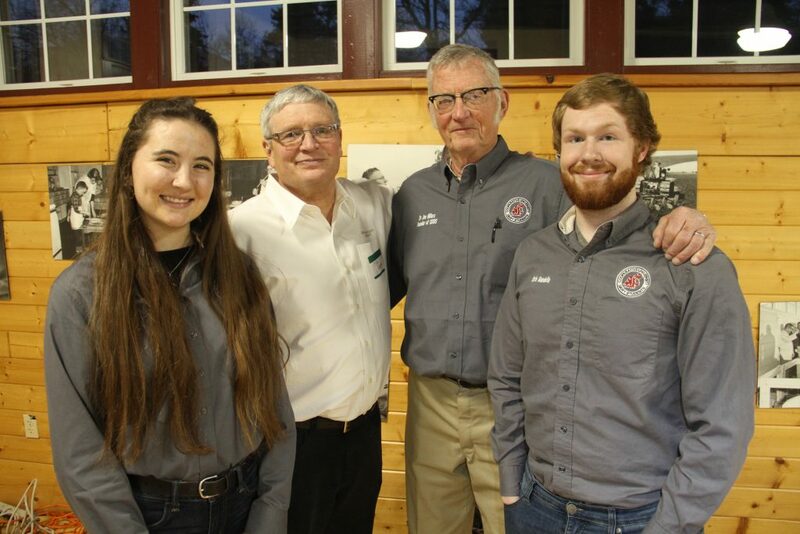 Three generations of students, instructors and alumni of Washington State University’s Cooperative University Dairy Students, or CUDS, came together on Jan. 26, 2019, to mark the 41st year and first reunion for this life-changing program. In CUDS, WSU students raise, milk and manage their own herd of cows and calves at the university’s Knott Dairy Center. Milk from the herd goes to the WSU Creamery for Ferdinand’s ice cream and Cougar Gold cheese. Fitting in dawn and evening milkings and midnight calvings with their studies and involvement on campus, students themselves gain an on-the-job education that helps power the Northwest dairy industry and grants them skills for life. 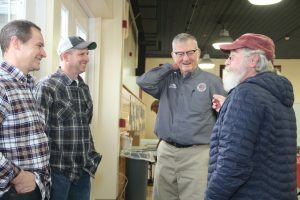 Retired Cooperative University Dairy Students faculty advisor Joe Hillers, center, chats with CUDS alumni and retired WSU Dairy Center employee Ferris Ferrar, right, during the first-ever CUDS reunion. André-Denis Wright, Dean of the College of Agricultural, Human, and Natural Resource Sciences, joined CUDS alumni to commemorate the occasion and share his academic journey. As a scientist, Wright helped dairy farmers, studying the microbiology of ruminants to increase digestive efficiency in dairy cattle. CAHNRS Dean André-Denis Wright meets CUDS alumni, faculty and student members. “I’ve taught lots of classes, as you know, and this is the best teaching program that I know,” said Hillers, who recounted how the early members built and improved their herd and practices. In the decades since, more than 300 graduates of CUDS took their hard-won skills to all aspects of the dairy industry, and many fields beyond. “You students did a super job—you need to be so proud!” said Hillers, who received a standing ovation from attendees for his legacy. At the reunion, Hillers and current advisor Joe Harrison encouraged support for WSU’s Friends of Animal Science Development Fund. Gifts given for CUDS will help students take part in hands-on industry experiences, and support scholarships. Learn more about CUDS here. CUDS past, present and future: 1978 charter student member Mike Wedam and Emeritus Prof. Joe Hillers join outgoing and current CUDS presidents Morgan Young and Chris Mandella. Current and former CUDS and WSU Animal Sciences faculty gather at the reunion: Assistant Prof. Amber Adams Progar; Prof. Joe Harrison; ret. Prof. Joe Hillers; retired WSU dairy herdsman Joe Blake; emeritus professor John McNamara; ret. Prof. John Swain.